MoguShan Vaults | The Fat Furry Tank. “To ask why we fight, is to ask why the leaves fall… it is in their nature” – Chen Stormstout. So I spent the last ten or so minutes before I went to bed last night, re-watching all the WoW cinematics. I still love them all. The Monologue that runs behind the Wrath of the Lich King trailer, spoken by Terenas Menathil, always makes me shiver. Blizzard do have a flair for the dramatic when it comes to cinematics. And Deathwings little spiel in his cinematic was just fantabulous! However, I found that Chen Stormstouts words in the Mists of Pandaria cinematic release to be very inspiring. I still remember the first time I saw the camera pan up over the top of Chen, and sweep over the valley in the Jade Forrest, revealing the landscape. I got goosebumps!! (damn straight, and I aint afraid to admit it haha!) I love WoW lore, I love new areas, and I love exploring. The landscape in Mists still has me pausing to take screenshots when I see certain things, or find things that I haven’t found before. And that’s part of the reason I love this game so much. You can sink hours of time into the things you’re “supposed” to do, but slow down sometimes, take a ride on your flying mount, and just look around. It’s. Beautiful. I finally finally hit exalted with the Shado-Pan this week. I got a bit lax with my dailies at one point and really steered away from doing them. 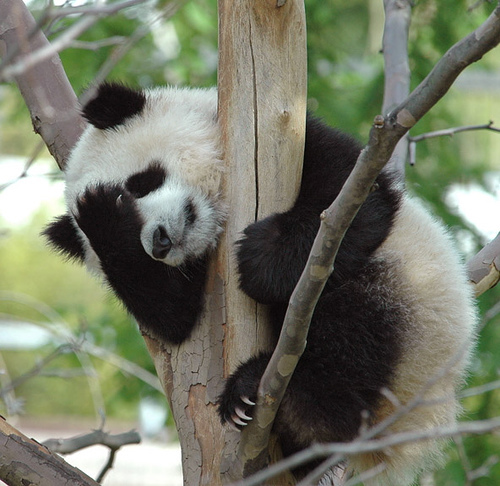 In the back of my mind there’s a tiny little panda version of myself dancing around laughing and poking me with a polearm saying “If you’d just done them all, you’d be finished with them!” and I keep throwing beer scented bamboo at it to make it go away! Regardless of my laziness, it felt good to hit exalted. Got myself some cool armored tigers that my alts can ride around on and look all important and such! Even though every man and his dog on my server has them already! I do like the feeling of accomplishment when I hit exalted with a faction. 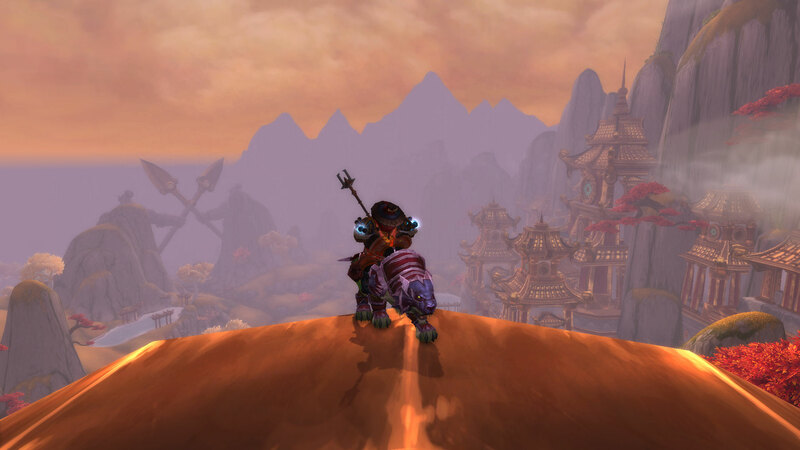 When I feel like dailies are sucking my soul out, I just remind myself of rep grinding in vanilla, and having to collect things for the argent dawn, and run Stratholme ALOT to raise that rep. I never did finish. Dailies are a nice way to rep grind, sort of. I just wish that there was some way that blizzard could tool it so that the mobs you kill for the dailies grant you rep. Although then people would pick them up and just keep their in quest log while they farmed rep I suppose, so that would be out of the question. I often speculate on these things, and then realize later on that someone, somewhere, would find some way to exploit it. I do not envy Blizzard their job, that’s for sure. The other bonus of hitting exalted… my replica shado-pan hat! I’ve never been so excited for an item before in my life. I hearthed back to the Shrine, and went straight to the Transmogrifier and got all up in that hat! I feel like a ninja panda now. Although how a fat panda can be stealthy is BEYOND me! Look at me in my ninja hat and riding my armored tiger!! WOO!!! On a side note, my raid team did it’s last turn in Mogu’Shan Vaults, and we will now be spending our nights in Heart of Fear. Hopefully not beating our faces against Blade Lord Ta’yak for much longer! This is the current fight that I find I’m having issues with. I don’t know whether to stack a little bit more stamina. But once again, that would mean sacrificing some of my avoidance stats. And I don’t feel as though I’m being hit hard, like I was in Will of the Emperor. Last week I missed a cool down on an overlap of overwhelming strike and got insta-killed. Never a fun moment. In my defense… no… wait… I have nothing. It was purely my fault. I admitted that, and we moved on. We got him to 7%… stupid whirlwinds. The raid damage that’s pumped out during the run up and down that hall is ridiculous. The tornadoes are stupid too! On my screen, I’ll have missed one completely, be a good distance away when I start shifting for the next one, and get caught in the previous one that I thought I’d avoided! It’s very frustrating. Not that my tanking dps really has that much benefit on that last phase, but every little bit helps. It’s all learning though! Guild Drama. Most of us have seen it, most of us have been part of it, and a lot of us have had to fix it. But what do you do when most of your guild is sectioned into smaller groups. It’s like high school all over again. As an officer, what do I do in this situation? People are assuming that we don’t care. And for some reason are not approaching us when they need help with, well, anything! I’m currently trying to push the use of our guild website a little bit more, as I find it a more structured environment than FaceBook, for this kind of thing. However it’s always the same people frequenting the forums. There are literally 5 of us, out of a guild of about 250+ members, that are currently talking about the steps to take to fix this lack of communication within our guild. What I seem to think is the major culprit of the hostility towards the officers is the raiding. It’s something I’m yet to bring up in as many words, because I don’t particularly see that stirring the pot has any benefit to any one. However what do we do? In cataclysm, I was the raid leader of the second raid team, one that cycled through members constantly, for many different reasons, weren’t progressing fast enough, people’s internet connections making it hell for the rest of us, personal issues flowing into the raid environment, and non-committal from a lot of my raiders. The other raid team had a steady roster that cleared content every week. When there are two ten man raid teams, this seems to be something that happens quite often. Currently we have 1 steady raid team, it just happens to be the one that I’m a part of (after making a decision at the end of cataclysm to give up raid leading and go back to main tanking). This team consists of people who work their asses off in the short time we have to raid (casual/social guild) and clear at a nice pace. However the second raid team that started before us, pushed hard and fast, and fell apart. They had a big raid group blow out in december, and nothing has happened since. Then there was suddenly a third group of people around December as well, that wanted to start a third raid team. At this point you’re probably wondering why we’re not running 25mans, instead of three 10 mans. The reason for this is that currently, we can’t even field two full 10 mans. And for some reason the majority of the guild seem to think this is the officers fault. But my question is, how can the officers help you build your raid team back up, if even when asked, you don’t tell us what you need to fill your ranks? How can the officers help with anything, if we’re never made aware that there are problems? I’m at a loss. And the forum post is just the same five people going round and round in circles.